For various reasons, I like to keep my personal life separate from my online one. I feel it’s just good practice and for the most part the personal stuff is probably a bit boring, There is, however, a story I would like to share with you. When I was little, the man of the house in my home was not the greatest of role models. I won’t go too deeply into that topic, but suffice to say, he was not the type of person one would actively emulate in later life. Because of this, my leading male influence was my grandfather. My grandpa always had time for us kids. Whenever he and my grandmother came to visit, he would always play with my brother, sister, and I, making us forget about the adult conversations we so eagerly tried to ease drop on or to interrupt. I can remember the ‘bets’ he used to make us, like ‘can you climb up to that branch’, or ‘can you run to that point and back in a minute’. These challenges were always just easy enough for us to succeed and were always met with a reward of a shiny quarter or a loonie when you got a bit older (a loonie is a Canadian dollar coin). I can remember going on trips to the camping grounds where they would park their trailer. One particular summer, my grandpa had a bike waiting for me, as he had taught me how to ride one the previous year. That year, there was a bike parade for all the kids on the grounds, and my grandpa and I decorated that bike with streamers woven through the spokes, balloons on the handlebars, and whatever else we could find to jazz it up. I won first prize for best decorated and awarded a 12 can flat of root beer. Not necessarily a great prize, but to my pre-adolescent self, it was as good as gold. I remember trying to give Grandpa half, but he said I earned it and it was all mine. As I grew older, I would see him less and less as we had moved out of province. When I was old enough to be out on my own, I moved even further away, but I would still make the effort to visit every so often. On the last trip I made before my backpacking trip to Australia, my grandpa pulled me to the side and said he had something to show me down in the car. We quietly removed ourselves from the unit, letting my Grandma and partner chat while we walked downstairs to the car park. He opened the boot and pulled out a small bottle of cherry whiskey. We sat there, on the hatch of the boot, taking sip for sip straight from the bottle, laughing the whole time that our significant others had no clue where we were or what we were up to. As we finished the bottle, he looked at me and told me how proud he was of me. He was proud of the man I had become and that he couldn’t ask for a better grandson. Last thing he said before we finished up, was that as soon as I got back from my trip, I’d have to visit as soon as possible and bring pictures. My time as a backpacker was phenomenal, and the time flew by. I realised I wanted to stay the extra year, so I made my way out to Perth to do some agricultural work. I still kept in touch with my Mum back home by phone, and let her know how my capsicum picking was going. On one particular call, my mother said that there was something she needed to say, and as she doesn’t sugar coat anything, she just came out and said it. “Your Grandpa has throat cancer and it has spread to his lungs. He’s undergoing surgery and chemo”. I asked how long she had known about this and why no one told me sooner. “He wanted you to enjoy your trip and to not have to worry about him”. After the call, I was angry. I cried. I threw things. I did, however, remain optimistic that the surgery would be successful and that he would make a full recovery. Either way, I decided that as soon as I was granted my second visa, I was going to take the first flight back home and visit. Two weeks later, I called again. “The spread was more extensive then they first thought. You may want to call your grandfather soon and talk to him”. I called him, trying to keep my voice steady. My grandma answered, and the shake in her voice was a clear indication of the type of month she had been having. How she remained so strong, I’ll never know. She put my Grandpa on and I could barely understand the man on the other end. His throat had undergone so much work that his voice was a mere ghost of the one that laughed with me as we enjoyed that bottle only a year prior. I tried to broach the subject of how he was, but he brushed off those questions and asked where I was and how I was doing. He wanted to hear all my stories and adventures. Sensing that he wanted to just have a normal conversation, I regaled him with tales of the mischief I had gotten into and the sights I had seen. He listened and laughed. It was a throaty laugh, devoid of the same audible punch it once had, but it still carried weight. He said ‘I’m really tired so I’m going to go lie down. I love you. Have a great time out there! I’m so proud’ and we hung up. Right then and there, I decided that visa or not, as soon I got my next two wages, I was buying those flights and heading back. He didn’t make it that long. Two days before I would have had enough money to afford the flights, my mother called and broke the news. She said he passed quietly and in his sleep. I stood there stunned, listening to how the funeral was soon and to not worry about the trip back as I wouldn’t have been able to make it there in time anyway. She said that he would have wanted me to have fun in Australia instead and that would be the best way to honour his memory. I had to agree with her. My grandfather was a great man who lived life and loved his family and friends to the fullest. He was quick to make a joke and the first to laugh at one. He believed that you shouldn’t take things too seriously. Though he was gone far sooner than anyone in my family would have liked, he left an impression on me that will last until the end of my days. He taught me the kind of man I wanted to be. 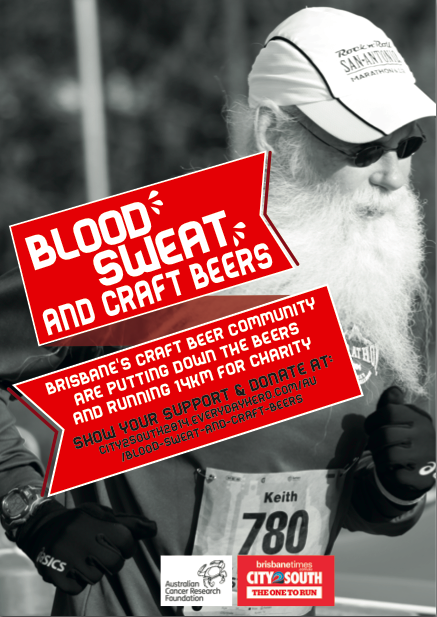 On June 15th, I’ll be running with other members of the craft beer community to help raise money for the Australian Cancer Research Foundation. Every runner has a reason for entering. Some want to prove to themselves they can do it and others run for loved ones they’ve lost or are fighting with a condition. My reason is pretty simple. I am running to keep him proud of me. Every step of that 14km will be my way of remembering him. I’ll be doing something for others, but having fun doing it with friends. That’s how he would have wanted it. I’ll be writing his initials on my shirt on race day so he will be there the whole way. Anyone who wants to add initials to the shirt of loved ones who are battling, have lost the battle, or won their battle, with cancer, please feel free to email me at jason@brewsandbacon.com. You can go to city2south2014.everydayhero.com/au/blood-sweat-and-craft-beers to donate or even to just leave the team some encouraging messages. He’d be proud Jase. Good on you.